The Filtertechnik portable patch test kit identifies and monitors types and levels of contamination in fluid power or fuel systems. It will help towards understanding and achieving IS04407. The particulate patch test kit enables instant visual analysis through an optical microscope of the major wear elements including bright and black metals, silica, fibres, elastomers, plastics, microbial growth (diesel bug) and others. A sample of the fluid to be tested is passed through a filter membrane via a vacuum pump. The slide is then dried and mounted in a membrane holder ready for visual assessment. A high-powered camera attached to the microscope allows pictures to be taken and particles sized correctly on screen. Software, also supplied helps with the understanding of the size and make up of the particulate collected on the slide. 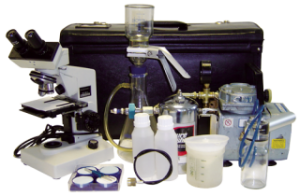 The kit is supplied complete with everything required for taking immediate samples and is simple to assemble and use. Full training available on request. For more information or to arrange a call from one of the Cea Laboratory technologies Team, please complete the contact form below. If your enquiry is urgent, please call us on 1300 552 725. Your information has been sent successfully. One of the Crea Laboratory technologies Team will be in contact with your shortly. A sentence here about related products with image links below to products you want customer to consider.